More than 1,000 people gathered on Saturday in Cambridge for the World Day for Lab Animals. The demonstrators gathered on Parker’s Piece before marching through Cambridge town centre. 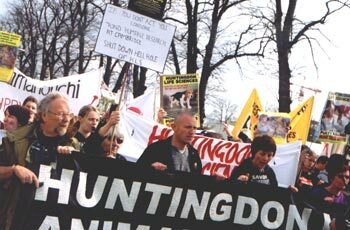 The march was organised by the Stop Huntingdon Animal Cruelty (SHAC) campaign, formed to force the closure of Huntingdon Life Sciences. Among those speaking on the day, ALF Press Officer Robin Webb stated that despite recent civil injunctions taken out against campaigners, that they would continue to fight HLS by whatever means necessary. Jerry Vlasak (MD, Trauma Surgeon) also gave a speech, stating that “animal research should and will be relegated to the dark ages”. 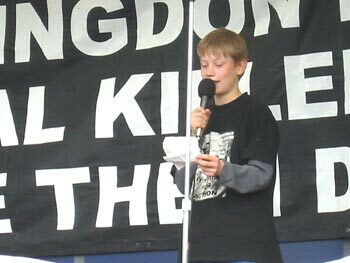 Fourteen year old campaigner Luke was introduced onstage by SHAC’s Greg Avery. Luke had been arrested for making phone calls to (former) HLS suppliers CPS Fuels. When the police had asked Luke to write an apologetic letter to HLS and to the suppliers, he refused, telling them he had not done anything wrong. 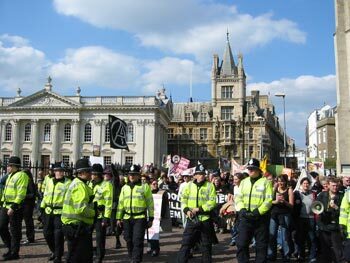 The Cambridgeshire constabulary were out in full force, handing out guidelines for the protest to demonstrators saying where and when they could assemble. For example, demonstrators were not to assemble for more than 15 minutes outside Downing Site, Cambridge University’s current centre for research using animals, and videos were not to be screened and animal noises were not to be played during the march through the city centre. Mel Broughton (SPEAK) gave the final speech of the day, reminding the crowd of the recent victory by local animal rights campaigners - Cambridge University’s decision not to go ahead with plans to build a primate research lab - stating “we are winning this war”. And it is only through massive loans provided by the government that SHAC has not yet won the war against HLS. The SHAC campaign has been one of the most successful direct action campaigns in recent history. SHAC was formed in 1999 and since then has had a devastating impact on HLS, with their share price dropping to 1p in 2001 (from £4 a decade previous). HLS survived only through the intervention of the government, who stepped in to replace the insurance providers who pulled out in 2001. When the Royal Bank of Scotland withdrew HLS’s overdraft facility in 2001, the government offered to provide financial support, the first time it has done so on behalf of a private company. HLS is Europe’s largest animal testing laboratory, and tests drugs and other commercial products on approximately 70,000 rats, dogs, monkeys and other animals each year. Companies pay HLS in order to test the toxicity of products before they are released to the consumer market, as required by Government safety standards. 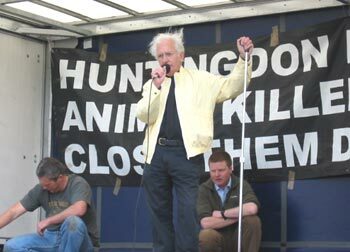 HLS has been a target of local animal rights campaigners since 1979, but became a prime UK target after the Channel 4 documentary ‘Countryside Undercover’ was screened in 1997. Containing undercover footage from inside HLS, it showed lab technicians punching and violently shaking beagle puppies being used for experiments. The formation of SHAC saw the launching of a worldwide campaign – SHAC has groups across Europe, the US and Australia. The activists who started SHAC had successfully campaigned for the closure of Consort beagle breeders (closed July 1997) and Hillgrove cat breeders (closed August 1999) using a similar style of relentless direct action campaigning. 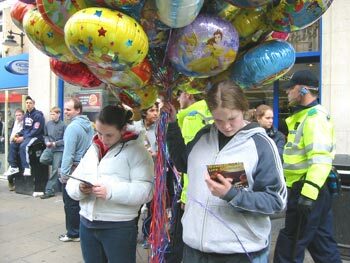 Of the legal interventions used to restrict direct action tactics since SHAC started, The Prevention from Harassment Act, intended as an anti-stalking law, was invoked by the High Court in 2003. There are now exclusion zones of 100 yards around the offices and private residences of HLS employees and their clients, restricting protest to once-weekly peaceful gatherings of no more than 12 people. SHAC activists remain steadfast in their commitment, despite the overwhelming police pressure that has resulted in raids of houses, arrests, and convictions. One of the most devastating and effective elements of the SHAC campaign is that they target not only HLS, but also the companies that do business with it, from the company's auditors, market makers, accountants, customers and underwriters, to their cleaning, lab equipment, fuel and office suppliers, gardening, catering and waste removal services. SHAC targets the heart and soul of the business: its finances, heralding a new era of direct activism. SHAC manages and directs activist energy towards one or two strategically chosen targets each week. That way, the intensity of the campaign against a particular individual or corporation is never diluted and rendered ineffective - they are aware that corporations can individually withstand sporadic and disorganised attacks. 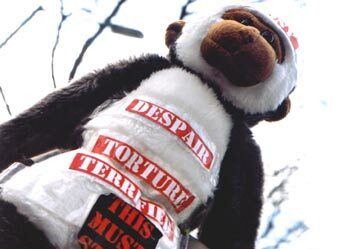 Frankie Trull, president of the Foundation for Biomedical Research, an organisation that advocates for the use of animals in medical research, acknowledged in an AP article (May 11, 2003), that the campaign “becomes a prototype for attacking any kind of business that does anything any group doesn't like”. SHAC spokespeople and industry representatives alike maintain that the SHAC campaign, if successful, will have far more serious ramifications that the closure of one company. In effect, if successful SHAC could provide a model for future campaigns both for animal rights and other activists.